Retinal detachment is a disorder of the eye in which the retina peels away from its underlying layer of support tissue. Fresh retinal detachment is a medical emergency. The development of macular pucker is similar to macular hole and is due to the separation of vitreous from the retinal surface. When the vitreous pulls away from the retina surface there is microscopic damage to it. 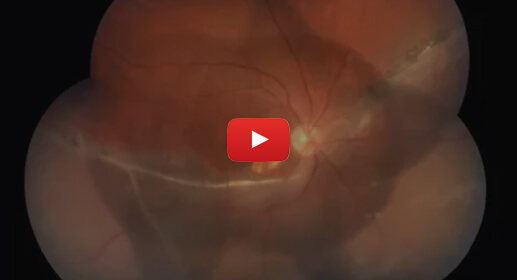 When this heals damaged retina is replaced by a scar tissue on its surface. When the macular scar tissue contracts it causes the macula to wrinkle or pucker. • Rhegmatogenous retinal detachment – A rhegmatogenous retinal detachment occurs due to a break in the retina that allows fluid to pass from the vitreous space into the subretinal space between the sensory retina and the retinal pigment epithelium. Retinal breaks are divided into three types - holes, tears and dialyses. Holes form due to retinal atrophy especially within an area of lattice degeneration. Tears are due to vitreoretinal traction. Dialyses which are very peripheral and circumferential may be either tractional or atrophic, the atrophic form most often occurring as idiopathic dialysis of the young. The tractional form occurs after trauma to the eye. • Tractional retinal detachment – A tractional retinal detachment occurs when fibrous or fibrovascular tissue, caused by an injury, inflammation or neovascularization, pulls the sensory retina from the retinal pigment epithelium. Detachment is more frequent in the middle-aged or elderly population . Retinal detachment is more common in those with high myopia (above 5–6 diopters), as their eyes are longer and the retina is stretched thin. Retinal detachment can occur more frequently after surgery for cataract. 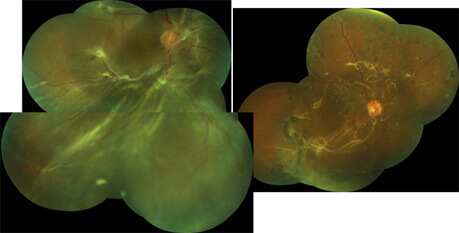 Tractional retinal detachments can also occur in patients with proliferative diabetic retinopathy or those with proliferative retinopathy of disease. In proliferative retinopathy, abnormal blood vessels (neovascularization) grow within the retina and extend into the vitreous. In advanced disease, the vessels can pull the retina away from the back wall of the eye causing a traction retinal detachment. Patient with flashes and floaters have a one in 5 chance (20%) risk of developing retinal detachment unless treated in a timely manner. 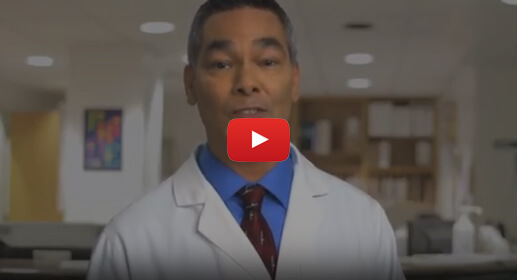 There are several methods of treating a detached retina, each of which depends on finding and closing the breaks that have formed in the retina. Cryotherapy(freezing) or laser photocoagulation are occasionally used alone to wall off a small area of retinal detachment so that the detachment does not spread. Scleral buckle surgery is an established treatment in which the eye surgeon sews one or more silicone bands (bands, tyres) to the sclera (the white outer coat of the eyeball). The bands push the wall of the eye inward against the retinal hole, closing the break or reducing fluid flow through it and reducing the effect of vitreous traction thereby allowing the retina to re-attach. Cryotherapy (freezing) is applied around retinal breaks prior to placing the buckle. Often subretinal fluid is drained as part of the buckling procedure. This operation is generally performed under local anesthesia. 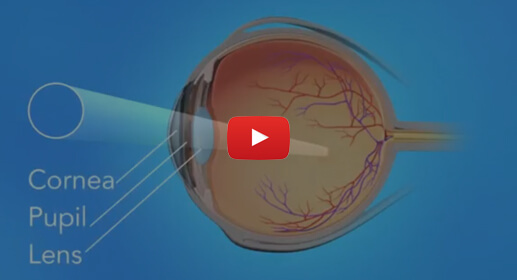 It is another method of repairing a retinal detachment in which a gas bubble (SF6 or C3F8 gas) is injected into the eye after which laser or freezing treatment is applied to the retinal hole. The patient's head is then positioned so that the bubble rests against the retinal hole. Patients may have to keep their heads tilted for several days to keep the gas bubble in contact with the retinal hole. This procedure is usually combined with cryopexy or laser photocoagulation. Vitrectomy is the most commonly performed operation for the treatment of retinal detachment (Rhegmatogenous and Tractional). It involves the removal of the vitreous gel and is usually combined with filling the eye with either a gas bubble (SF6 or C3 F8gas) or silicon oil. Advantages of using gas in this operation is that there is no myopic shift after the operation and gas is absorbed within a few weeks. Silicon oil (PDMS), if filled needs to be removed after a period of 2–8 months depending on surgeon's preference. 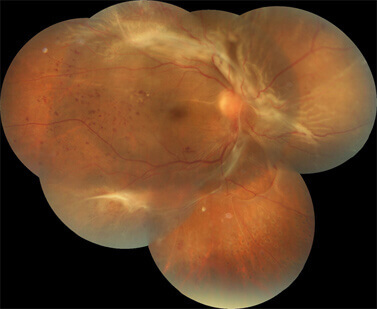 Silicon oil is more commonly used in cases associated with proliferative vitreo-retinopathy (PVR). Vitrectomy is sometimes associated with progression of cataract. 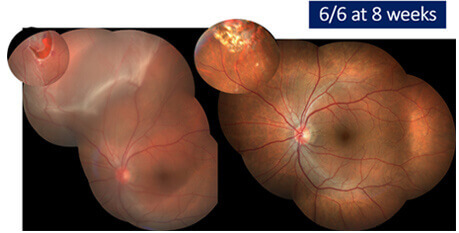 Pre-operative and post-operative pictures of a patient with retinal detachment. 25 G vitrectomy with endolaser was done.